FOREVER HEALTHY BLOG ! : You Can End Mouth Odour ! You can combat mouth odour and other related mouth issues. Sometimes, brushing twice daily, flossing and the use of mouth wash does not help in anyway. In fact, using toothpaste that contains fluoride is very injurious to your mouth, surprised? Don't be. With the chemical composition of a lot of mouth wash liquids available in the market today, you will be doing yourself more harm than good if you used them. But then there is a healthier and proven way to combat this menace. This solution has the Aloe Vera gel as its main ingredient. My younger sister used to have this terrible mouth odour that was a big issue for her. She would have to brush as many times as possible in a day just to keep her mouth fresh. Where it wasn't convenient for her to brush, she bought mint flavoured gum but then the effect was only temporal. 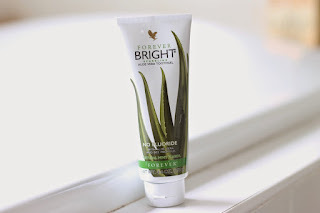 When I found this toothpaste from forever living product, I decided to give it to her to try it out. In the process of usage, we discovered its healing ability because her bleeding gum got healed plus the green plaque that had almost become a permanent art work in her teeth came off within two weeks. Well, there you have it. Her mouth odour stopped. Whatever abnormally in her mouth causing the bad odour was corrected just by using this product. Also, remember to share it too. You will be helping someone.